So... longtime readers and personal friends know that twins fascinate me. All multiple births do, really, but twins are the most common and therefore the most intriguing for me. As such, it shouldn't really surprise you to find out that as soon as I heard that Abby and Brittany Hensel were going to have a television show, I was thrilled. See, I knew exactly who they were without seeing the many commercials TLC has aired. I was introduced to the duo back when they turned 16, as a special about them had aired, showing them taking the DMV test twice and discussing some of their everyday challenges. The girls specifically mentioned toward the end of the program that they didn't want to be filmed all of the time, so imagine my surprise when, six years later, they were back! I'm thrilled to be following the Hensel girls, even if just for eight episodes. First, some basics about Abby & Brittany. They have two hearts, four lungs, two stomachs (on opposite sides, so they can't feel their own stomachaches! ), and one reproductive system. Abby has the straighter hair and is on the right (she's 5'2") and Brittany has the crimpier hair and is on the left (she's 4'10"). They actually had to have spinal surgery at some point to keep their growths closer to equal. When they have coffee, Brittany gets jittery Abby doesn't. And, for those wondering when they "count" as one person versus two... they have individual social security numbers, have separate driver's licenses and passports, and applied for teaching certifications separately. They pay 1.5 tuition because they are getting two degrees but it's all the same classes and stuff. They only take up one seat on a plane or at a restaurant, so they only require one ticket, etc. Abby & Brittany "Spring Break, Here We Come!" (S01E02): It's March 2012 and the girls have been doing 40 hours of student-teaching each week, with one class on Mondays. [why did they pick up their caps and gown so early?] They've gotten resumes and applications out to several districts in the area, but they know that there are a lot of teachers out there without jobs so the competition is steep. For Spring Break, they fly to Houston with their mom and a friend to visit another woman, Tamara, with conjoined twins (though they've passed away). Tamara works in the school system and gets them an interview with two principals from different schools. To prepare, they look through some of Tamara's old teaching stuff for ideas, write their thank-you notes in advance, and then tell the viewers about their money perspectives - they can only teach one class, so they'll only get one salary, but because they can offer two different perspectives, have two degrees, and can monitor or grade while the other teaches, they can do more than one person can, so they would want to negotiate a higher salary after they get some experience. [though it's not the ideal situation, I think it's pretty reasonable.] They talk about the questions they were asked in the interviews and are very excited about a second interview. Other things they do on this trip include shopping (Brittany likes more neutrals and Abby prefers brighter colors), getting manicures and pedicures (Brittany isn't a fan of the process but Abby is), and riding a tandem bike with Kayla. They go lay out by the pool but the weather isn't that warm. Abby & Brittany "Road Trip!" (S01E03): The girls pack for a drive to Chicago for a weekend with some friends. [in the car, they wear the seatbelt under Brittany's armpit when they're driving.] They do a segway tour of Chicago )Brittany likes cities better than Abby), struggling to balance at first, as their legs are different lengths and their torso is a bit asymmetrical. Later, they go for deep dish pizza, head to the Willis Tower (only Brittany is scared of heights), see the Chicago Bean, then chill out with their friends in the hotel room. Abby gets hotter more quickly than Brittany and they often have different parts of their body different temperatures. The first morning in London they take an open-top bus tour. When they take photos, Abby clicks the shutter but they take turns using the viewfinder. Their friends try to stand in the way of others so random photos aren't taken of the girls too much. [it's bothersome that all people in atypical situations find themselves in scenarios like this.] They all have high tea (Abby isn't as food-adventurous as Brittany). They go to Abbey Road to take a photo. 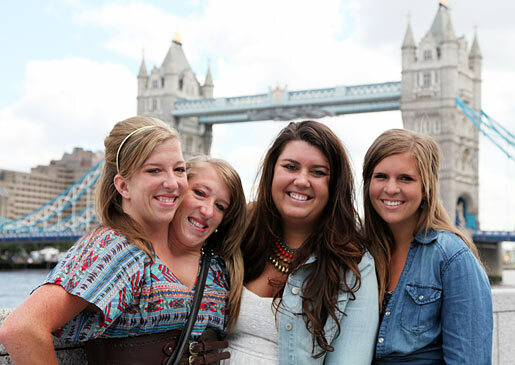 Brittany would like to live in London but Abby is more of a homebody. [I guessed that from earlier comments.] They go to take a rowing lesson on the Thames, starting with some indoor rowing machines to get the basics. Abby has broken her foot twice and Brittany has broken her foot three times, so they're a bit paranoid about getting into the boat. They figure out the coordination after a few tries but the entire boat struggles to be synchronized. Toward the end of their trip, the girls visit a family that they taught and go to a farm/playground place with them. [interesting place! I wanna go, LoL.] Their final night in London, they went to the Eye.